“Sweet is the lore which Nature brings; Our meddling intellect Mis-shapes the beauteous forms of things We murder to dissect. And, as he went, he had a very strange adventure. It was a clear still September night, and the moon shone so brightly down through the water, that he could not sleep, though he shut his eyes as tight as possible. 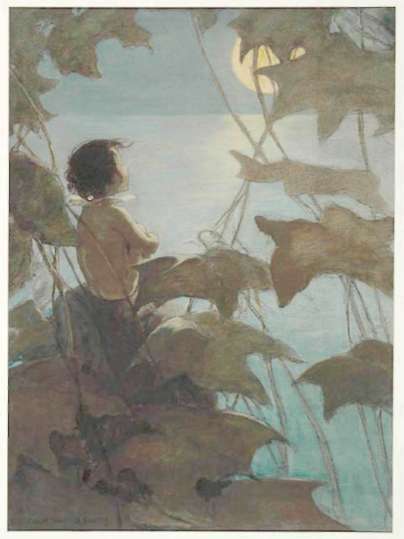 So at last he came up to the top, and sat upon a little point of rock, and looked up at the broad yellow moon, and wondered what she was, and thought that she looked at him. And he watched the moonlight on the rippling river, and the black heads of the firs, and the silver-frosted lawns, and listened to the owl’s hoot, and the snipe’s bleat, and the fox’s bark, and the otter’s laugh; and smelt the soft perfume of the birches, and the wafts of heather honey off the grouse moor far above; and felt very happy, though he could not well tell why. You, of course, would have been very cold sitting there on a September night, without the least bit of clothes on your wet back; but Tom was a water-baby, and therefore felt cold no more than a fish.